There is always someone in a hurry to get from one place to the next. Those who leave it to the last moment in a blind panic that they can't get to the next place because they have to wait to be processed before moving on. Or worse get to the boarding gate to find they missed their flight and then jump up and down creating a scene. On the other hand there are those who are super early and have the time to sit back to watch the maddening pace around them. There are others who have suddenly so much time and few distractions they can get on and read that book they have put off reading for a long time. Others who find a place to curl up and sleep because no-one gets the opportunity on the plane. Airports are like a bubble that you are trapped in. Given a glimpse of the outside world through shiny glass. You can't hear the birds, feel the wind on your face or even dig up the dirt! They are sterile and clean, polished and shiny, loud and cavernous but mostly grey! Of course they are the link to get you to your final destination so worth tolerating for 10 hrs... I think? I like the excitement you feel being at an airport but I think I can wait a while before having to return again. What do you think about airports? For my birthday last month I suggested to Mr R that I would like something at the front entrance to make a statement and grow a climber over. Here is the card I received at my birthday this year. I have had a Abeka vine going nowhere right at the front for a number of years. Originally there was a fence along the front but it was another one of those things about the house that was falling down so we helped it along and pulled it out. Quite an old photo but the only one I could find of the fence. The dog looks young and the dead camellia hadn't quite been removed. The Akeba vine is just near the gas box. Anyway Mr R finally had a bit of time to work on the front entrance at last. However I am not quite sure what to call it. Is it and Arbor or pergola or something else altogether? Although it is not quite finished (we need side bars to grow the climber on) and the pavers need to be re laid. Here is the result. I think it is a great job he has done. It needs some work but I am chuffed with the structure. I think the gas box has be worked on next. Now I am off on holidays for a number of weeks so I thought I best take some photos of how the vegie gardens look before I left. Not a lot of produce it has to be said but then I expect it needs a bit more love than I have been able to put in lately. This week we turned up at one of my clients and I got stuck into the vegie garden. Neevil arrived about a half hour later and we discussed a dead Tahitian lime that had slowly been dying for a couple of months. Then suddenly I noticed the pear tree lying over the roof of my clients house. Yes I had been there for about an hour before realising that it was no longer standing. My observation powers were not turned on. Sadly this is one of my clients favourite trees so she was sad to hear about it (she is on holiday so heard from her daughter). This particular pear had large white flowers that were followed by fruit that never developed fully but in the last few years it has been dying back a little at a time. The pear has been in for at least 35 years (the time my client has lived here). There hasn't really been big wind or even a lot of rain this week but I expect root rot. The wood was a little mushy but I don't expect Phytophthora which has taken a number of trees in this garden as the top of the tree hadn't died off like the others. It is almost like a giant has broken it away from the roots. 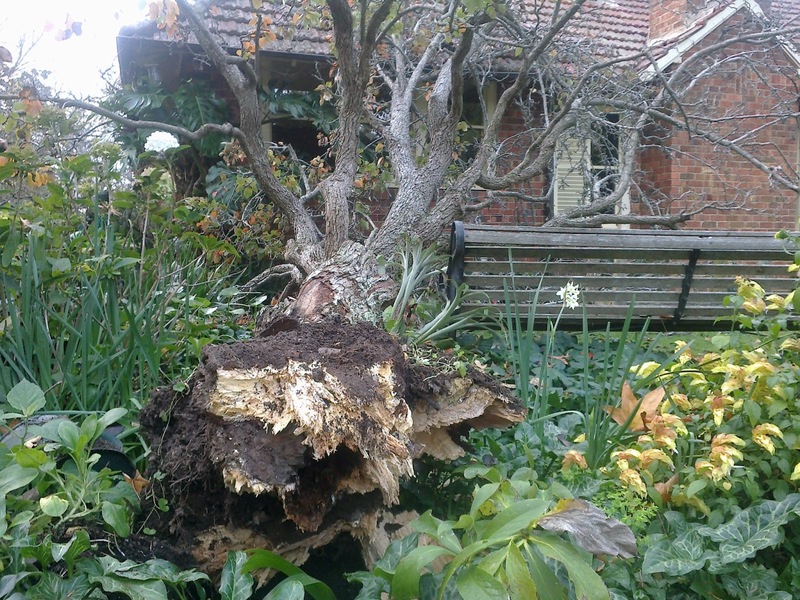 Thankfully the damage was quite small 5 tiles were broken and a slightly dented gutter but it missed the windows and there was no great damage to any of the plants under the tree. I guess it will take us a while to get used to the space that the tree consumed. I guess these are the things we have to accept when gardening that things change sometimes when we really don't want them to. 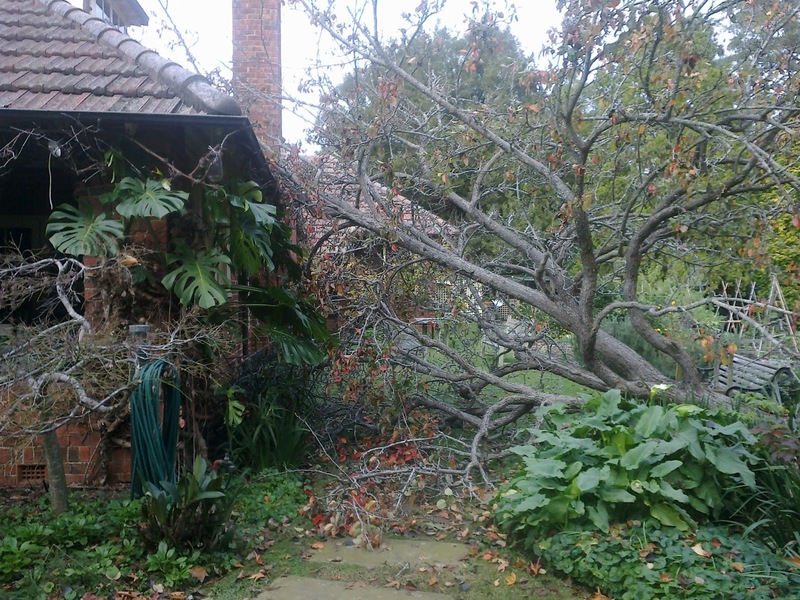 However that aside I wanted to talk about my liquidambar. When I was training in hort I had a teacher who suggested that provided the ground is moist and it gets very cold temperatures at night autumn trees will have amazing colour. This year my grounds went kept constantly moist and I don't think the temps have dropped that much until maybe the last few day (we are now in winter of course). This being said have a look at my liquidambar. Our liquidambar has been mostly yellow in the past but this year we have been treated to a number of colours. Yellow. orange and reds.